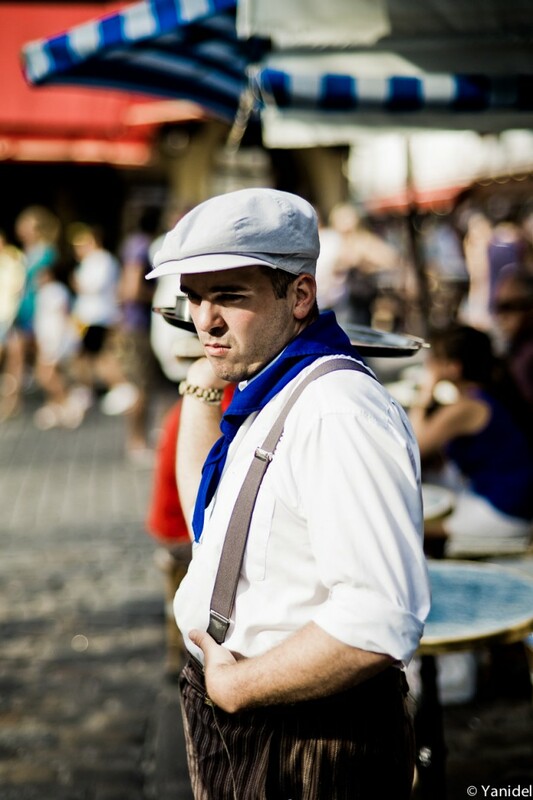 Weekly poll #9 : How many days a week do you shoot street photography ? After basically 24 months of shooting whenever I wanted, my street time will drastically fall from now on. What about you, how many days a week can you dedicate to shooting ? 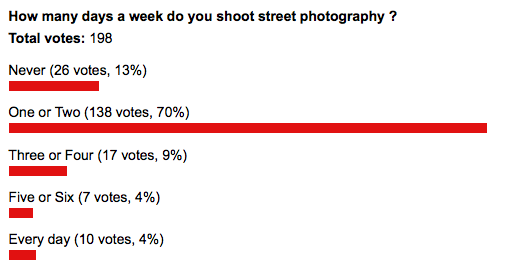 As for last week’s poll “Film or digital for street photography” (229 votes), 70% of participants shoot digital. No surprise yet the number of film shooters ended up higher than I expected. This is great news. Usually i have one weekday off to go shoot, weekends are with the lady, and it's rare that i get two weekdays to shoot! Usually, lunch time or walking home/work or work/home. In the summer half of the year typically 5 days, but with a full time job I can't shoot as often as I want to in the winter. Not as much as I like. May be 0.5 day a week. Nice photo. I like the way he stands and nice background bokeh. Shadow over his eyes, does that bother me ? I don't know. Do you use flash while street photography-ing ? Had to answer never for now. It used to be one or two but since then my workload has increased and the fading light of the north has made sure of the rest of the illusions of keeping up with the pace. I mean dark empty streets aren't all that interesting . . . I'm usually out every day on the weekend, but during the week, my other job had kept me pinned down to the ground. But I've hit on somewhat of a way around this, specially during the winter months. I shifted my hours later in the day and have incorporated morning walks as a form of exercise. It just so happens that a camera is always with me and that I constantly change my route looking for more intersting things. Now I get out a couple of days a week early. The only side effect: I really don't want to get back to the office.